Radiolocating is the process of finding the user’s location using radio waves. Various basic method exists, all with their advantages and flaws. A first techniques uses the received signal strength (RSS) to estimate the propagation length. A second technique uses the time of arrival (TOA), when the time of transmission and speed of propagation are known. This TOA can use either pulsed signals or coded signals combined with correlation techniques. 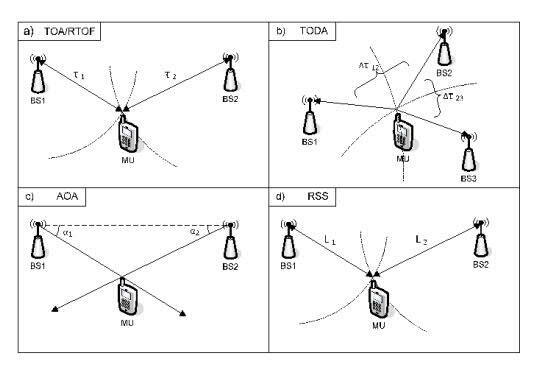 Combining TOA data from several receivers at different known locations (also known as time difference of arrival, TDOA) can provide an estimate of position even in the absence of knowledge of the time of transmission. Another class of methods is the angle of arrival (AOA) using a directional antenna or by using differential time of arrival at an array of antennas with known location. The aim of this thesis is to first study the different techniques in detail, include their accuracy and precision (i.e. the uncertainty on the estimates). In a next step, the different methods are combined and merged with other sources of information, such as measurements using GPS, speed, and direction measurements. This so-called sensor fusion needs to take the statistical variations into account to optimally determine the position (and possibly the speed and direction) of the user. After studying the methods and the theoretical results of the sensor fusion, the thesis aims to apply the techniques. This can be done using a combination of a smart phone, Pozyx indoor position system, and/or USRP’s (Universal Software Defined Radio) which measure the radio signals directly.